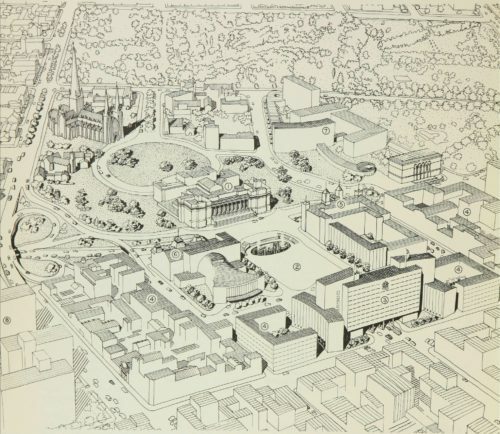 In the mid-20th century there were many crazy plans to rebuild Melbourne as a modern city, and this proposal from the Melbourne Metropolitan Planning Scheme 1954 would be one of the most extreme – the entire top end of Bourke Street would be bulldozed to make room for a new civic square. The key components was a Civic Square at the corner of Bourke and Spring Street, and a new Town Hall located above Bourke Street at the western of of the new square. Chapter 13 of the Melbourne Metropolitan Planning Scheme 1954 describes the concept. Every community has need at times for ceremonies of national rejoicing or solemn commemoration, and a city should have a place where its citizens can assemble together for such purposes. Apart from the environs of the Shrine of Remembrance, where any ceremony can fittingly be associated only with the purpose of the Shrine, there is no place in Melbourne where such ceremonies can be appropriately conducted. Our city lacks a civic focal point. 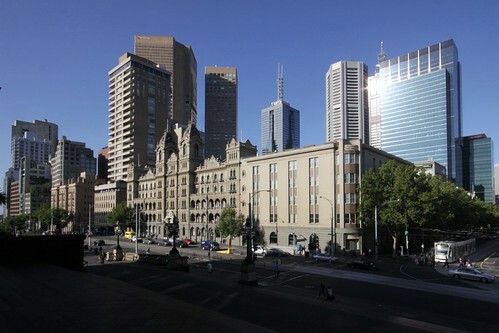 The centre of civic administration is the Melbourne Town Hall which, despite its many fine features, is located in such a congested area and on such an inadequate site that it does not provide for the needs of a city. The centre of governmental administration is much better chosen, but many government departments are scattered throughout the central area and occupy space which should more appropriately be used for commercial purposes. The offices of semi-governmental bodies are also widely separated. It is apparent that if all the administrative offices of government departments, semi-government bodies and the municipality of Melbourne were grouped in one locality, not only would the dealings of these bodies with each other be facilitated, but it would be a great convenience to all citizens. In addition, sites now occupied by public bodies in various parts of the central area would become available for more appropriate uses. 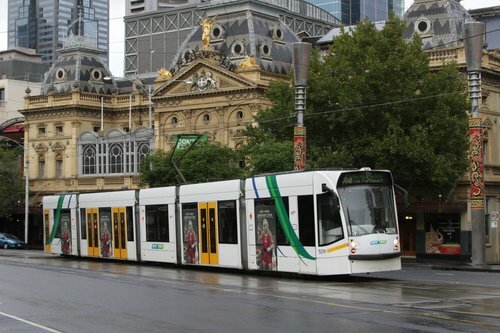 In Melbourne the Commonwealth Government has acquired the city block bounded by Spring, Latrobe, Exhibition and Lonsdale Streets, and has plans to build on half the area within the next seven years so that Commonwealth departments in Melbourne can be accommodated together. State Government departments are located in the Government Office Building between Spring Street and Lansdowne Street, and the Chief Government Architect believes that this site can be developed to accommodate all the State departments which for efficiency should be in close contact with each other. 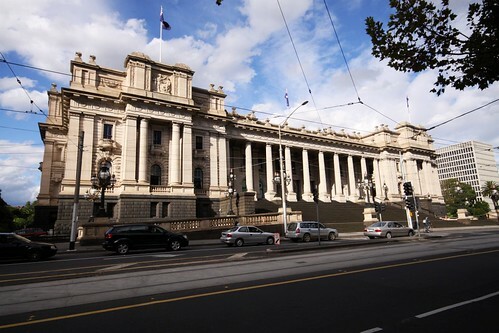 Nearby in Spring Street and facing down Bourke Street is State Parliament House. It is no new conception that in front of Parliament House there should be an open space for ceremonial and other occasions. Various sites have been suggested for a Civic Centre and there will probably always be some difference of opinion as to which one is the most suitable. In reviewing all these matters, the conclusion is reached that, because of present and proposed development in the vicinity, a grouping of government and civic activities around Parliament House is both logical and appropriate. Many different ways of doing this could be propounded and each would have its advocates and each its merits. It is not the function of the planning scheme to determine just how this should be done, but it has been necessary to consider the possibilities of the area for the purpose. Diagram 38 shows in perspective one conception of how the environs of Parliament House could be developed to provide a Civic and Administrative Centre worthy of the city. This is not presented as the complete and detailed study necessary before any positive action is taken, but merely to illustrate the potentialities of the locality. (a) Creation of a civic square for the full width of Parliament House and extending some distance down Bourke Street towards Exhibition Street. (b) The erection of buildings of a monumental character around the square to provide for a Town Hail and municipal offices, for offices for public authorities and for appropriate private uses. (c) The retention of the Princess Theatre and the Windsor Hotel which when rebuilt, as some day they must be, can be brought into architectural harmony with the surroundings. (d) Public garage accommodation on several levels under the Civic Square. (e) Depressing Spring Street from the south side of Collins Street to the north side of Bourke Street as part of the ultimate development of the City Ring Road, thus permitting approach to Parliament House above Spring Street from the Civic Square. (f) Widening, to the extent shown, of Little Collins Street and Little Bourke Street and their connection to the Civic Square at its west end to facilitate traffic movement and to enhance the value of the properties abutting those streets. (g) The creation of an open area between Parliament House and the ecclesiastical buildings grouped in the vicinity, by diverting road traffic in Gisborne Street and incorporation of some of the grounds of Parliament House. To permit this or some other appropriate development being gradually achieved, the area has been included in Special Use Zone No. 13, in which the uses have been regulated accordingly. No doubt many people, for various reasons, will oppose the whole or portion of this conception, but a civic centre is badly needed in Melbourne. It would not only enhance the charm and amenities of this already beautiful city, but would be an asset appropriate to a city of 2,500,000 people. The retention of the Princess Theatre and the Windsor Hotel which when rebuilt, as some day they must be. can be brought into architectural harmony with the surroundings. Can you imagine demolishing the Windsor Hotel? At least Parliament House would be retained! Another positive outcome of the plan being abandoned is avoiding a tangle of freeway off-ramps at the corner of Spring and Lonsdale Street – part of the long abandoned City Ring Road plans. The MMBW put out a film in 1954 promoting the Melbourne Metropolitan Planning Scheme put out by Sydney-based Cinesound, better known for their newsreels after World War II, however they did make feature films films prior to that. Mr and Mrs Petrov at 12:04 in that movie.